Just Bambinos Product Articles and Blogs: PREGNANCY AND RUBELLA. Rubella, or German measles, as it's sometimes known, has fallen in numbers since the MMR vaccine was introduced in the late eighties. This vaccine covers Measles, Mumps and Rubella and has greatly reduced the incidence of deaths from these diseases. Unfortunately, some research was published by Dr Andrew Wakefield, in which he linked the MMR vaccine to autism in children. This caused many parents to choose not to have their children vaccinated thus causing the infection rates to rise. His work has since been discredited and many further studies were performed in which no such link was found. Unfortunately, although Rubella is usually only a mild infection that is extremely common in children, it can cause serious concern if caught by a pregnant woman in the first 16-18 weeks of that pregnancy. This is due to the virus being able to disrupt the development of the baby during those first crucial weeks. It can have devastating effects on the newborn such as deafness, blindness, heart abnormalities and differing severities of brain damage. It can also cause miscarriage or stillbirth. If the Rubella infection is passed to the unborn baby and causes one of these defects, this is referred to as CRS or congenital Rubella syndrome. CRS may also cause problems in later life such as Hyper-thyroidism or Hypo-thyroidism, Type 1 diabetes, Pneumonia or swelling of the brain. Therefore it is extremely important to keep the incidence of cross infection to a minimum. You can reduce these risks by ensuring all your children are kept up to date with their immunisations and also, if trying for a baby, attend your GP and ask him to test your immunity levels as these may wear off over time. If the test reveals that you have no Rubella antibodies, or very few, you will be offered the MMR vaccine yourself. You can only have this vaccine before pregnancy and not during the pregnancy as it is a live vaccine. If you do need the vaccine, it is important NOT to become pregnant for at least one month after. Rubella is one of the routine antenatal screening tests given by your midwife. If it is found that you are not immune, it is important that you avoid coming into contact with anyone who may be suffering with the virus. If you suspect that you have had contact, you should contact your GP or midwife. This can be difficult to ascertain as the infection takes up to a week before symptoms appear, and they remain infectious for up to six days after the rash commences. If you have no immunity, and you choose to receive the MMR postnatally, you can rest assured that you can still breastfeed without any risks to the baby. If you do contract the Rubella virus during your first trimester, your consultant obstetrician may want to to check to see if the infection has caused defects in the baby. This may include simple things like an ultrasound scan, or more invasive testing such as an amniocentesis if you should so choose. This will help to determine the extent, if any, of any birth defects your baby may have contracted. You will also be offered counselling enabling you to decide whether to continue with the pregnancy or not. The incubation period can take 2-3 weeks to develop. During this time it can be almost impossible to diagnose Rubella. 1. Red-pink rash which may or may not be itchy. This usually starts behind the ears and may spread to the trunk, arms and legs. 2. Cold like symptoms, including a runny nose and eyes, a cough and a sore throat often with a raised temperature. 3. Swollen lymph nodes, usually at the back of the head, below the skull, behind the ears and in the neck area. If you notice any of these symptoms in yourself or someone you have been in contact with, and are pregnant, or are trying to become pregnant, you should inform your GP although you should not attend the surgery in person therefore reducing the risk of passing on the infection. They will in turn, inform Public Health department so they may help track the spread of the disease and advise you of the next step. 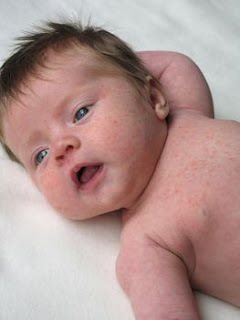 Next weeks blog is PREGNANCY AND CHICKENPOX. Regular appointments and nutritious food prevents your baby from infection. I so wish that you had been writing this blog a couple of years ago when I was pregnant - I think it's such a great resource for expectant mothers, especially the web chat facility! BTW, I don't know if you take much stock in this type of thing but I have awarded you the Versatile Blogger Award! I was lucky enough to receive it myself and have the honour of choosing other bloggers to also receive it and you were on my list!